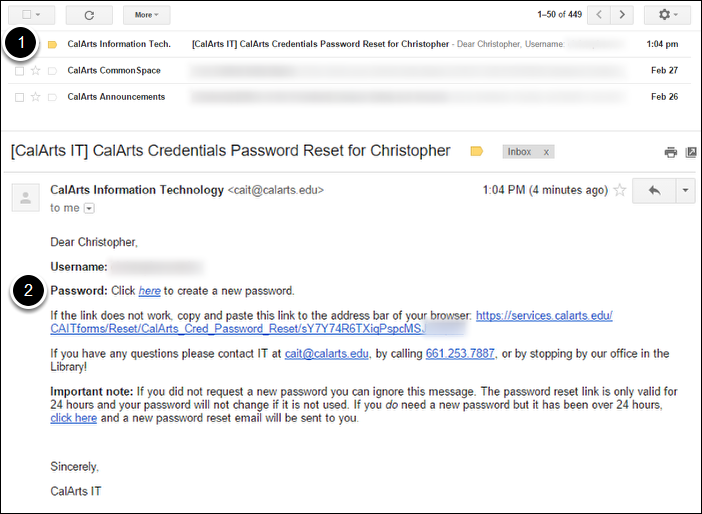 How Do I: Reset My CalArts Credentials Password? Your CalArts Credentials are used for most services that IT manages. If you've forgotten your Hub password, can't log in to CASecure, or just want to change your password to something else, just follow the steps below! 1. 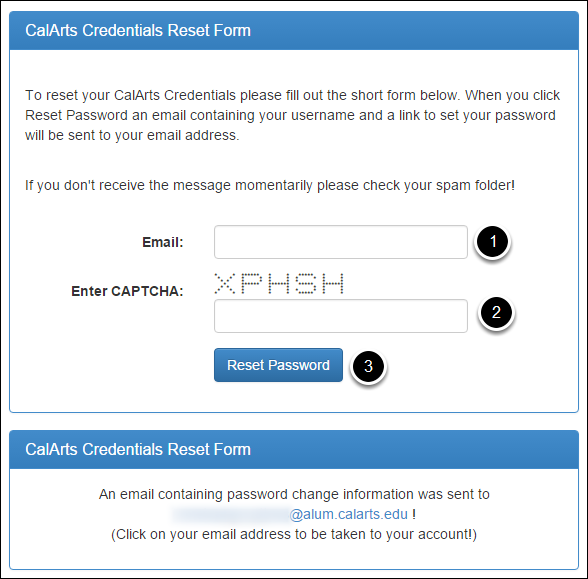 Click on "Reset Your CalArts Credentials"
At the bottom of every page on the CAIT site there is a Reset Your Calarts Credentials link. Scroll down to the bottom of this page and click on that link. Make sure you use your full CalArts email address, whether it ends in @calarts.edu or @alum.calarts.edu, followed by the CAPTCHA letters you see. When you're done with that click on Reset Password. On the next page click on your email address and you'll be taken to your CalArts inbox. In that message is one-time password reset link. When you click on that link you'll be taken to the password reset page! 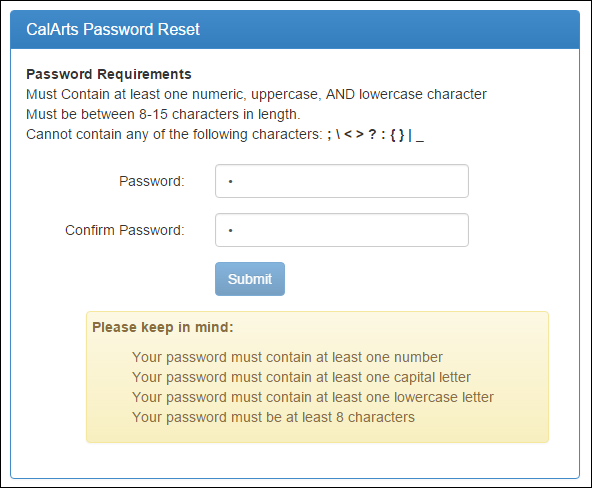 As you enter your password the system will check what you've entered to make sure it meets our minimum requirements. If your password meets our minimum requirements the the Submit button will be a dark blue. Otherwise you should see a warning telling you what part of our password requirements haven't been met. For instance the 1 character password I've tried doesn't meet any of our requirements and I can't click the Submit button. 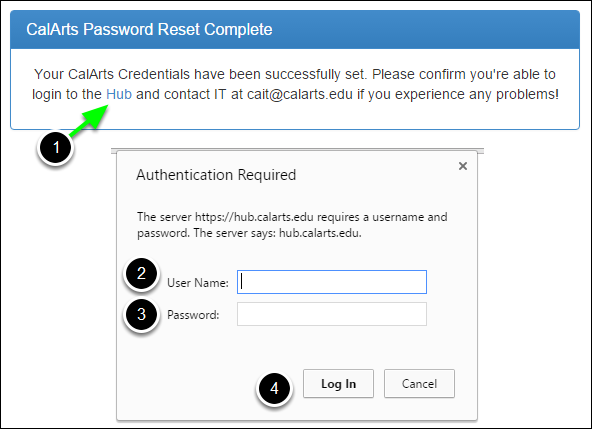 Clicking on the Hub link will let you test your CalArts Credentials with your new password. Make sure to enter just your username, not your email address. If you include @calarts.edu or @alum.calarts.edu your login will not work, even with your new password! If you have any trouble please don't hesitate to send us a ticket by emailing cait@calarts.edu! Where is HubTime and How Do I Use It? How Do I: Register for Courses?